If you are using Outlook for Mac, use the following methods to delete messages stuck in your Outbox. When the message is stuck because it has a large attachment, the Outbox should be visible in the folder list. This will re-send the message without the over-sized attachment. If you don't want to send the message, delete it from the outbox instead of removing the attachment. Either click the Stop Sync button (2) in the lower left or the little x at the right of the entry to stop the send and receive. Once you stop the send and receive, the Outbox will be visible (3) in the folder list. Hold the Shift key down while reopening Outlook. Go to Outbox and delete the stuck message. 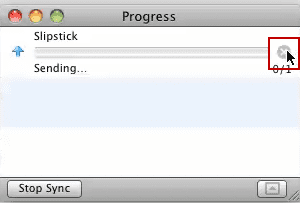 If the Outbox is not visible, initiate a send and receive and open the Progress dialog. Either click the Stop Sync button in the lower left or the little x at the right of the entry to stop the send and receive. The Outbox should now be visible in message list and you can remove the attachments or delete the message. I tried all of the above, working offline , opening the progress box and nothing is there andthe comment keeps on popping up.Any idea to solve the issue? I have tried to send an email with a list of addresses in the BCC line. Obviously, one of them was not valid so Outlook for MAC 2011 gave me an error message. However, now I cannot see the message anymore and no interrupting during sending or shift and restart will make it reappear. Clueless what else to try. Anybody out there who knows? Thank you, Thank you, Thank you. I've been trying to fix this issue for days, but couldn't locate my outbox. So glad you had better directions then everyone else. I accidentally tried to send an email through Outlook to my gmail address a few days ago with a very large attachment (100+ MB). As soon as I realized how large the file was, I tried to stop the send from the outbox while it was showing but it disappeared. Now, I can't find the message anywhere but my Outlook is SLOW! I keep getting the spinning circle with every few characters that I type. I have tried all of the suggested steps above but the email is nowhere to be found. Any other suggestions? I'm having the exact same issue. I can't "X" out on the sending item in the Progress Folder. Let me know if you have any answers! This is with the older (original) outlook client that came with Office 2011 or the newer Outlook client (with the blue icon)? If you disconnect from the internet and wait a bit, can you delete it? It's odd, my messages are being send, however after they are sent and the process, they are sent to the Oubox and they stay there (after the fact that they've been sent) can't seem to make the stupid folder go way! Are you using the Outlook 2011 update that was released a few weeks ago?